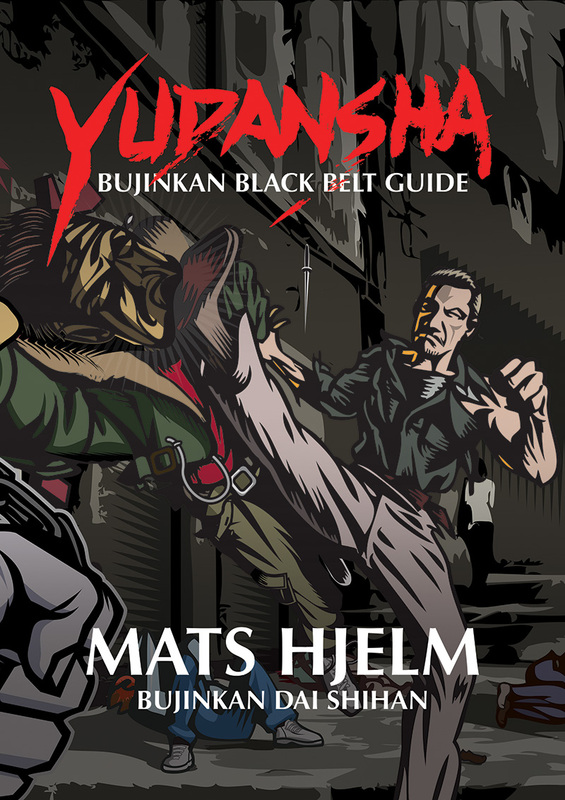 I see and feel there is a big misunderstanding about the training philosophy in the Bujinkan by many. Some instructors doesn’t seem to care if their students learn or not. I think too few people in Bujinkan are really giving any deeper thoughts about the kihon, it seems everyone only want to do randori training. Doing cool stuff without really knowing why it sometimes work may not be the answer. Thinking that more randori training will somehow reveal that knowledge is a trap if you ask me. Sure if you give it enough time maybe you can get pretty good. But there is a shorter more stream lined way to learn our art properly. It starts by learning the alphabet and understand each word individually and then how they correlate with each other before finally putting them together into beautiful and meaningful poetry seen as a master piece. If you are perfectly happy with doing randori training without deeper thoughts, this would be a good time to stop reading and go somewhere else! Here is what I consider the three important keys to learn any art properly. You can see this as Shu-Ha-Ri, but you should not get stuck on one level before going to the other. This is why I say keys, you need all three of them at the same time. You go back and forth between kihon, henka and randori all the time in training. In the beginning you should focus more on kihon training, it is more important and most revealing when it is done wrong. It is also easier to break bad habits and get good habits. In randori it is easier to come up with excuses (cover ups). The only one you fool by ignoring this is yourself. You should always go back and polish your basics until they shine brightly from all angles. I strongly believe in learning the basic techniques properly. The human body is constructed in a limited way, the variety’s between two human beings is very small when it comes to how the body works. I mean the elbow for example does not bend in all directions, some people can’t get the arm completely straight, some people can over extend. but no one can bend the elbow more than one direction. The same goes for every part of the body, everyone is built almost exactly the same. So all the basic techniques we study in the Bujinkan is made to work 180 degrees against the body mechanics. When the opponent starts rolling his shoulder, the angle of the pressure against the elbow changes. It is not the elbow itself that changes, it is the rest of the body that changes the situation, this is where it starts to get difficult to perform the arm-bar lock correctly. If you do the arm-bar technique perfect you will limit the opponent’s way of moving around and changing his other body parts to be able to escape. When you do a basic technique perfect, it should be impossible for the opponent to do anything about it. If he can counter or escape, your basic technique might not be that good. A basic technique should always work if done properly, there should never be an excuse for a badly performed technique, maybe a bad judgement of what you should have done instead. Take your time figuring out how to do the technique correctly. Make sure that the opponents attack is exactly the same, giving a different attack than demonstrated is not helping the performer to understand the technique. This is study, don’t forget that. Both uke and tori are studying the best way to perform the basic technique. This is like learning the alphabet and the words, and what they really mean. When the opponent change his attacking technique it becomes more difficult, and you need to adjust to that. This is when it gets complicated and confusing, you need to change (henka) to get into the path of the basic technique (kihon) to be able to execute the basic technique perfectly. When you get into the path of a basic technique it should again be impossible for the opponent to do anything about it. Take your time to figure out how to get in to the path of the basic technique (or another basic technique). The uke can change the way he attacks, but don’t change to quickly trying to escape. It is not a competition, you are helping each other to discover the different ways to enter into a basic technique. Henka is a misunderstood concept by many, it does not mean that you can do whatever you want and call it a henka. A henka on what I ask? No, a henka is when you need to change from the technique you initially decided to do, to another technique because it became to hard or difficult. Doing a henka because you can’t do the kihon is a bad excuse, or maybe bad judgement of which technique you should have initiated from the beginning. This is like learning how different words are connected to each other, and how putting one before the other changes the meaning. This is a more advanced way of training, the importance here is not to stop and think. You are training to intuitively react and do something, anything but stopping your movement. What you should strive to is to applying any basic technique in the end, the way you’re getting there should be naturally and effortlessly. This is the goal. Doing this without goal is pointless. You should always end up where you have total control of the opponent in such a way that he can’t do anything that you don’t want him to do. Often you don’t know where the outcome of any given attack will end because you do the most appropriate technique depending on the opponents reaction to your first initial reaction. You do not force the opponent into a pre determined technique. Sōke often refers this to being zero, or no thinking. It is like water that always go with the gravity, you can manipulate and redirect the flow bit by bit until you get it where you want it. But you can’t force it to go away from gravity, you are reacting with the nature not against it. In the end you still need to take control of the situation completely. In training be playful, don’t worry if you can’t get everything perfect. The main focus of this type of training is to do everything described above without stopping. You will miss many things, it is like playing music in a band, keep playing and pretend no one heard it. The more experienced is just better of covering up their mistakes. Do not do change the speed from starting slow and then suddenly do something at full speed just to prove you’re better. How fast the attack initially is decides the speed both trainees should continue until the uke is controlled at the end. Remember this is not a competition, it is still a learning process, the uke is destined to “loose” and get controlled by the tori in the end. Also remember that many of the techniques we do in Bujinkan is dangerous! We can not execute them out fully without injuries. If your ego takes over and you suddenly counter at full speed against the person that is destined to “win” the technique to try and come out as the “winner”, you should be happy if he let you “win” instead of breaking your arm or knock you out. Again, this is training and not a match! Bujinkan is not a sport, the techniques are designed to do damage. If there would be a match, someone will get injured and maybe killed. This is like a full sentence where each word contributes to a meaningful and beautiful masterpiece. Kaeshi-waza: It is also important to train on how to counter and reverse each one of the basic techniques. Try to find out which counter technique is appropriate, find the weakness in each technique. With that in mind try to strengthen your basic techniques so that a counter finally is impossible. With that in mind try to find the weakness, it is there somewhere, maybe? But don’t make it a competition help each other with the studies. Sannin-dori: Practice the techniques against several opponents, or many against one. Shinken / Jissen: Real or actual fighting is different than training. You will be surprised and unprepared, you might get scared or paralysed. Any technique we use in Bujinkan is good enough to use in a real situation, you just need to be wise enough to know which technique to apply and when. Buki: We use a whole lot of weapons in the Bujinkan, they also have their own kihon and henka based up on its characteristics. We train with each weapon and learn its characteristics so that we can use anything at hand. Heiho: We learn strategies from nature and man. Everything from environmental changes to psychology of humans, and animals. Ha, when I finished writing this article I had no plan other than expressing how important I believe kihon is. After finishing the end notes I realized they where five. Together with the three keys it is eight. And we all know eight is the the limitless number “8” in the Kihon-happō. I might have forgot something important, but this realization gives me confidence to click on the publish button even if I don’t have pictures as I planned when starting this essay. I’ll add pictures later, this feels good :-).